We’ve gotten some curious questions about our lifestyle here. Some are easy to answer. How your Spanish? Coming along. How is being vegan in the land of jamón? Great, actually. Once people witness our abundant joy from living in Madrid, we can almost see the gears start turning in their heads. Inevitably they imagine themselves abroad with extended lunch rendezvous and eternally sunny weather. Ultimately though, it comes down to one question: what’s the real cost of living in Madrid? The affordability of a Madrid is one of many contributing factors as to why we moved, and why we are staying another year. Aside from living abroad legally (Veren teaches English through the government) one must answer the financial questions first. We aren’t students but we do live on a budget. Our budget is pretty much the cost of living in Madrid for students as well. While we’re seeing prices slowly increasing as the country crawls out of the crisis, the average salary in Madrid is still quite low, so prices in Madrid are low. These are some of the average prices for the cost of living in Madrid. All prices listed are in euros. How much rent do you pay in Madrid? Of course we get this question – but more so because our friends (and us) are from New York City and sky-high rent is the bane of our existence. It’s one of the most expensive cities in the world. 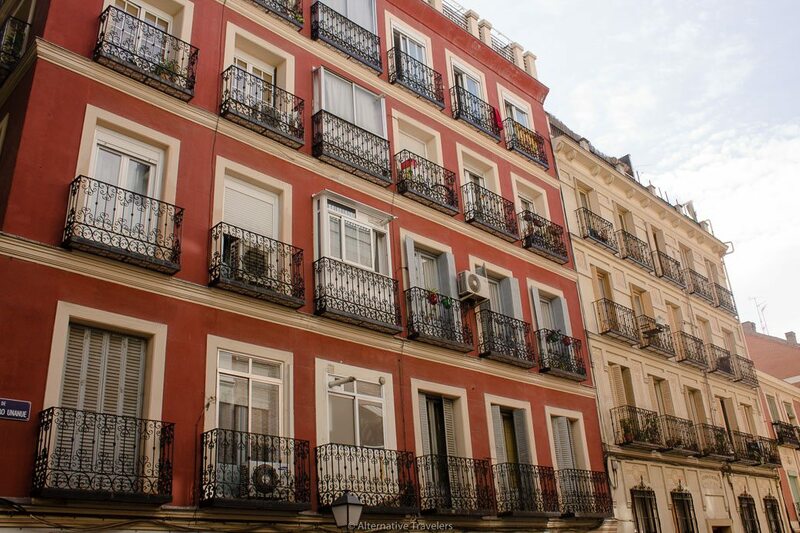 Rent in Madrid, like anywhere, is highly variable. Depends on where you live, if you will have roommates, and how posh the flat is. Room in the center: 300 (lucky) – 550 (pricey). Expect to pay at least a 400 for a room in the center, just because it’s the center and in high demand. Unlike New York, Madrid has a distinct center where all fun radiates outward from, and consequently many people never want to leave the party. Most people living in Madrid as students gravitate towards these spots, so finding a room is much more difficult in August – October. Check Idealista to find a place. For a one bedroom all to yourself, expect to pay between 600 – 800 in the center. Outside the center you can find deals for 200 – 300 for a room, studios and one bedroom for 400-500, and two bedrooms for 750 – 1000. Utilities vary, especially since the cost of electricity is so high in Spain. If you’re looking for apartments in Madrid and one comes with heat included, grab it immediately! Contrary to popular belief, Madrid does get cold in the winter, dipping below freezing overnight at least a few times (though it doesn’t snow). We spend between 50 – 100 a month on utilities for two people. This includes internet, electricity, and water. For example, we spent under 25 euros a month on Internet with Pepephone, the only company that will let you get internet without a fixed landline. Heating costs will rise in winter. We last paid 180 for the 3 coldest months. Groceries are incredibly cheap in Spain, in large part because a montón of products are made within the country. We spend about 15 euros 3 – 4 times a week on groceries. Let’s say err on the more side, so 240 per month. For two people. Veren used to spend that on just himself per month in New York City, and most people still don’t believe he spent that little. The biggest thing foreigners will probably notice about Spanish supermarkets will probably be the lack of copious amounts of options. No aisles filled with 100 different kinds of ketchup. That’s actually a good thing, and some western supermarkets are actually reducing their options to reduce customer stress. Grocery shopping in Spain is refreshing because you don’t have to spend time deliberating which type of type of toilet paper to get. Tomato: .99/kilo ( less than fifty cents a pound and we just bought some of the last of the summer harvest at a euro for 2 kilos). We like to eat well, with lots of fresh produce. Sure, if all you ate was bread and pasta, you could spend less, but you wouldn’t come all the way to Spain to do that (we hope). One of the many joys of living in Madrid is being able to eat out on a regular basis without breaking the bank. Eating out with family and friends is a sacred tradition in Spain. We eat out at least once a week, often twice, and more so if we’re feeling social. (Check out our ultimate vegan guide to Madrid for our take on all the vegan restaurants in Madrid + veg-friendly ones). Menú del dia: 8-13 euros. (A menú del día is a 3-course weekday lunch deal that includes 1st plate, 2nd plate, dessert, and a drink!) See our recommendations for the best menú del dias. Tapas (small bites come with drinks free), larger sharing plates: 4 – 12. (Check out our list for the best vegan tapas in Madrid). Madrid is all about public access to cultural events and spaces. Many are free, and practically all are affordable. Movie prices: 9 euros normally, but we go on budget days/times (4.50 on Wednesdays). About every other week we catch a film, although we’d go more often if there were more movies we wanted to see. Museums: Most have designated free times/days, but our favorites, like the Railway Museum and the Archaeological Museum, cost 2.50 and 3 euros respectively. Local/live music: if you’re looking to catch local music, expect venues to be under 10. A visiting indie group may cost 15 – 20, someone more popular like 30, but for huge bands expect the usual prices. Not only is the public transport here excellent, but super affordable as well. Many travelers to Madrid won’t even use the metro as it’s so walkable, and if they do hop on, it’s in the city center (zone A). But the transportation system in Madrid covers not only the city but the entire region of Madrid as well. Bicimad (city bike scheme): 15 – 25/year pass, then 1 euro per hour. Taxis: 30 euros flat rate from the airport to city. A trip within the city may cost between 5-8 euros, but we never take taxis so use this handy calculator to get a better idea. You should know: we don’t really buy stuff. We advertise ourselves as budget travelers for a reason. Buying less stuff means less time working to pay for stuff we don’t need. And the money we do have, we spend on things that mean more to us, like food and travel. When we do shop, go to thrift stores. Some days have special deals, all items 3 euros, or 5, or 10. A 50% off sale means a warm winter coat for Veren. Brand name things cost more here in Spain (except Zara, which is a Spanish brand). Expect electronics to be more expensive (especially Apple products), but if they’re European made, you definitely get a better deal. For example, we were super excited to see Sennheiser headphones way cheaper on Amazon in Europe than in the U.S. Obviously we snatched up a couple pairs because Veren is an audiology snob. Having a drink on the everywhere terrazas never gets old. So that about wraps up all the basics of living in Madrid. Sure the euro fluctuates, but you’ll be hard-pressed to find somewhere this cheap in the US that is also a major international city. Also, we can’t stress enough – just because it’s cheaper doesn’t mean it’s less quality. Living in Madrid has quite literally upgraded our quality of life. The food is arguably better, and fresher. The public transportation puts New York City to shame – and Sam’s aunt (an NYC railroad engineer) can personally attest to this. We’re super fortunate to call Madrid our second home. Have you considered living abroad for extended period of time? What cities and places have you found very liveable? We’d love to hear from you. Pin Cost of Living in Madrid!